For most travelers to Far-west Tibet the prime focus of their journey is the sacred peak of Mount Kailash(6,658 metres). This extraordinary mountain is regarded as the "heart of the world", the center of Asia, by Buddhists, Hindus and the followers of other spiritual traditions. 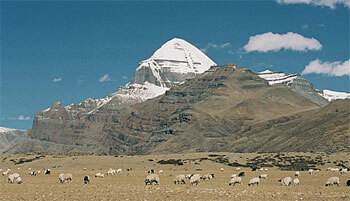 Of all special destinations for the travelers to reach, Mount Kailash is surely one of most sublime and sacred. Day 21: Lhasa-Chengdu-Beijing, 1N in 3 star hotel. Day 17-20: Tsada-Lhasa,We will return to Lhasa by retracing the original route we took, stopping on the way to play frisbee in the grasslands with Tibetan children or photographing golden haired yaks grazing in the sunset. Day 21: Lhasa-Chengdu-Beijing, in the early morning transfer to airport and fly to Chengdu, then connecting flight to Beijing, self transfer to hotel and then free time. 1N in 3 star hotel.